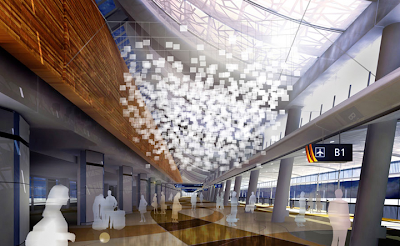 Take a look at this incredibly dynamic artwork from Dan Goods that's set to grace San Jose International Airport in 2010. Called the eCloud, each panel can go from completely transparent based on the weather and wind conditions of airports across the US. I think it serves as an excellent metaphor to Silicon Valley itself, constantly changing and reacting to the various feeds of information culminating here. You can even see a conceptual video of this masterpiece in action. In other airport news, the "Hands" artwork covering the monolithic parking structure serving The North Concourse and Terminal B is coming along nicely. A quick glance while you're driving down 87 will give you an idea of what's to come... and so far so good. This past weekend I have been able to do something at Santana Row that I have not been able to do for quite some time... easily find parking on a Saturday. 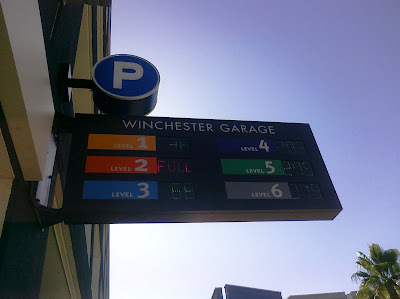 Over 800 new parking spaces have opened up in the Winchester Garage, along with 2 very fast new elevators and an express ramp from Winchester Blvd. directly up to the 3rd floor of the structure. They also made some improvements to the flow of traffic on the ground floor, essentially making most of it a one way street. Overall, I'm impressed with the upgrade but if the garage were completely full I can see a huge mess with traffic where the express ramp hits Winchester. I think that would be an ideal place to have a stoplight, making it easier to both get on the express ramp and exit towards Stevens Creek. At the very least, I don't think anyone will be having a hard time finding parking at the Row anytime soon! Downtown San Jose Photo Walk! Despite the harsh economy, all is not doom and gloom in the south bay restaurant scene. In fact, last week a brand new top-tier restaurant opened in downtown San Jose where The Melting Pot used to be. Maceio is phenomenal. I have been to over 90 restaurants in downtown San Jose, and I would put this on my top 5 list. The food, drinks, service, and ambiance are all exceptional. The best way to describe Maceio would be a carnivore's candy shop. You'll be treated to over a dozen different meats cut table-side including bacon wrapped fillet mignon, tri-tip marinated in a house sause, top sirloin, lamb, and house made sausages. There is also an extensive side-bar buffet and Brazilian appetizers served to your table (fried bananas and salgadinhas). I would also recommend trying a caiparinha with your meal, a sweet yet potent drink featuring Brazilian rum. When all is said and done, it's not cheap... but the experience is well worth it. Clear your schedule, come hungry, sit back and enjoy. I'll definitely be going back for seconds. The first 6 gates in San Jose International's shiny new Terminal B will be opening on July 15th. All of the gates will be dedicated to Southwest, but that may change when the terminal is completely finished in mid 2010. Accompanying the new gates will be a new restaurant called "The Sharks Cage" along with a handful of new retail options. Terminal B will encompass 380,000 square feet and is a $342 million chunk of the overall $1.3 billion airport improvement problem. For more details, click here. In the latest Downtown Dimension, they also listed some interesting statistics from the U.S. Census Bureau showing exactly how fast San Jose has grown over the past 60 years. I find it pretty amazing that we have gone from a city of 95,000 people in 1950 to breaking the million-person barrier this year (and overtaking Detroit as the 10th most populous city in the US). I hope that as we continue to grow, infrastructure will keep up and our communities will be designed with density in mind and less reliance on cars for transportation. Here are a few casual shots I took last Friday just walking around. 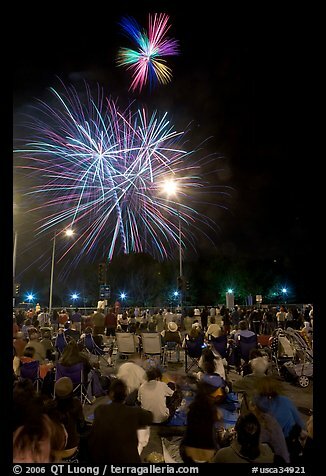 Lots of people out having a great time, the way it should be. Click on the photos to enlarge! Dine Downtown was a huge success! Restaurant week will certainly be back next year and there are even talks about having it twice per year. Broadway San Jose will occupy the San Jose Center of the Performing Arts and already has a dozen Broadway-caliber performances booked. The Civic Auditorium is receiving a $13mil upgrade. Ross is spending $1mil to prepare their 27 S. First Street store for opening this fall. $6.8mil has been approved for converting St. James and Julian from one-way streets to two-way streets. This will slow down traffic and should provide for a more "walkable" experience. La Vic's expansion at the Santa Clara St. location is on track. There is a new hot dog stand at the corner of Market & Santa Clara. It looks like the upscale Safeway called "The Market" in downtown San Jose is really coming along. I managed to sneak a few photos while walking by and you can make out a sushi bar (the Rivermark Safeway in Santa Clara has one of these) and a Tully's coffee stand. Also, it looks like 4 different elevators will service the store. Two of them are off to the side and are the main elevators for the public parking structure at The 88, and the other two are in the store itself and are still under construction. My guess is that the additional two elevators will go directly from reserved Safeway parking into the store, and perhaps are the reason why the public garage has not opened yet. I swung by the airport a few days ago and have to say that it's really coming along. The new concourse looks phenomenal! It has a very modern, open, and welcoming feel to it. The mostly-glass facade lets you peek inside at what's to come, and it puts the ancient terminal A to shame. The new taxi/bus stands are already operational and it looks like the monolithic parking structure is just receiving finishing touches. One of these weekends I'll have to head over there with the cameras and snap a few shots!